In your body, many functions are synchronized with your internal clock. Your body learns and expects something from you. For example, it learns that the best time to wake up in the morning is when melatonin secretion stops and testosterone is highest. Then, in the evening, your melatonin starts to rise preparing yourself again for sleep. Consistency in daily rhythms is paramount to our performance and health. You can prepare your body for the next phase to match your chronotype and reduce stress. Unfortunately, there is no universal daily schedule for everybody, as we are all different. Chronotype is at least 50% genetically determined, but you can train your body and adjust your circadian rhythm. Some are morning persons, who can sleep early and can easily wake up in the morning. They even adapt faster to different time zones when traveling and are the fortunate people in current society, more successful and healthy. However, in the evening they are not able to socialize as efficiently as evening persons. On the other hand, many artists and creative people are evening persons and they need to adjust every day to the requirements of society to be able to wake up early enough and make it to work or school. Their health is usually worse and their daily performance is slower. Science has shown these differences between chronotypes in terms of cognitive performance. Cognitive performance has been studied by people’s typing speed in search engines and showed that 4-5 am is the lowest performance for most of the people. While we have early sleepers (or morning chronotype) and late sleepers (or evening chronotype), all of them have better performance during the day than at night time. Morning chronotypes have their peak performance earlier than intermediate types, while late sleepers have lower performance during the day. Also, morning people have a steep decline in performance in the late afternoon while intermediates don’t, and late sleepers don’t really feel the difference between later afternoon and night. Research has shown that most people need 7-9 hours of sleep to achieve their highest performance. Shorter sleep (up to 4 hours) does not affect performance significantly. BUT, if these people have a compensatory sleep of 9 hours the next day, their performance actually declines. So, it doesn’t help to sleep in during the weekends! Contrary to our beliefs. Also, waking up late has a higher negative impact than sleeping more hours. So, if you need to sleep more, go to bed earlier! Another study has shown that doing homework at the same time of the day during the week and on the weekends gives students higher average grades. The same principle may apply to work. For example, athletes who train every day at the same time and at the same time as the competition, significantly improve their performance. Ideally, heart rate and body temperature should be the lowest around 4 am and then rise to prepare the body for the morning (the hammock pattern). However, alcohol, late meals, and late exercise keep the metabolism high and heart rate is lowest when we should wake up in the morning (downward slope pattern). Also, if we go to bed too late or too tired, our heart rate goes up during the first half of the night and we don’t get enough restorative sleep (the dune pattern). Ideally, we should wake up in synchronization with the rising sun. Morning people are ready to wake up with the rising sun if they are living in latitudes where sunrise is constant. However, in latitudes where the sunrise is not constant or when people sleep in during the weekends, there is a phenomenon called social jet lag. Oura statistics show that people get 7 hours of sleep on average; however, instability in sleep time has a standard deviation of 65 minutes. Thus, Oura ring users are getting 6-8 hours of sleep, which shows inconsistency. A new feature of the Oura ring calculates your most common wake up times and suggests 30-min to 1 hour optimal bedtime periods when your data shows you’re getting the best sleep. So… What’s more important, living according to your chronotype or consistency? Hannu suggests that it should be the consistency that fits your lifestyle. You can change your lifestyle to a certain degree not only sleep, but also training, eating, etc. We should find a compromise between our optimal sleep window and our life requirements. We should remember that we don’t transition from a hectic life to a peaceful sleep. We should organize our day in a way that in the end, we are satisfied and grateful. Reflecting on what we did during the day and be grateful helps us reduce the stress in our lives and improve our sleep quality. 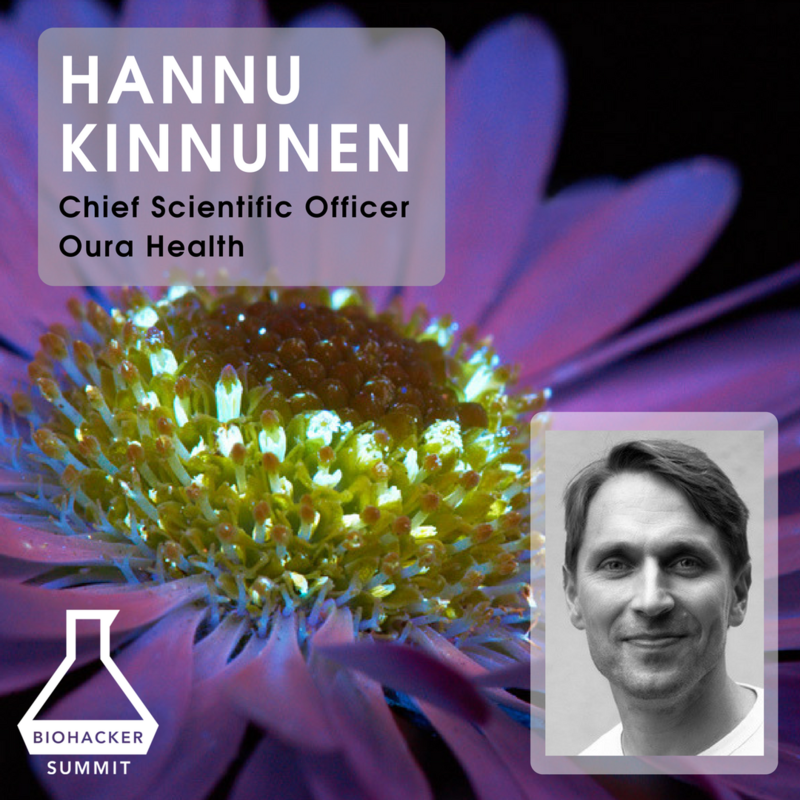 Watch more presentations from the Biohacker Summit 2018 Stockholm video series here. Use the code BLS for a discount on the ring! Learn more about Oura ring here. This article was written by Evguenia Alechine, PhD.